Microsoft Office Suite is a handy tool. Its uses are for writing, editing, presentation and calculation work. Microsoft Excel is no doubt a multi-utility platform. It is used for a wide range of purposes by analysts, bankers, marketers, and accountants. Business schools too impart training in Excel. The internet has a wide range of MS Excel tutorials. It instructs you on its efficient usage. These tutorials will give you an in-depth knowledge of Microsoft Excel. We have listed some resources to benefit you. These websites will teach you essential data management and analysis skills. Microsoft Excel Help Center is the best platform to learn excel online. It is an official website of Microsoft. A collection of tutorials will help you to learn MS Excel. Topics in the tutorials cover Data formats, Pivot Tables etc. Tutorials are available on mail merges. In addition, you can choose the guides relevant to your current needs. Most importantly, some tutorials contain practical experiments. This enables you to get a hands-on experience. “Ask The Community” platform provides solutions to queries. GCF LearnFree.org has one of the most detailed free resources to learn Excel online. It offers 29 tutorials and an addition of five tutorials. Besides, you will learn Excel basics and advanced lessons. In addition, the instructions come in simple terms for you to practice. Further, you will get a quiz at the end of the tutorials. This will assess your knowledge. Excel Exposure is another best resource to learn excel online. It has a free online training course with links to video lessons. It covers topics like conditional formatting, error checking and macros. It deals with advanced concepts too. Complicated issues tend to split into simple terms throughout. This makes even Visual Basic for Applications (VBA) easy to learn. Notably, Excel Exposure has a large group of followers. The lessons split into Beginner, Secondary and Advanced levels. A section on Excel 2013 too is available. Chandoo too is a vibrant platform to learn MS Excel online. You can begin with the fundamentals and move on to advanced topics. In addition, it has over 450 articles and tutorials on MS Excel. You will learn conditional formatting and create reports at a faster pace. Tips found on this website come from forums. Solutions to formulas, formatting, shortcuts, pivot tables, etc find their way here. Besides, a section on Excel VBA proves to be helpful. 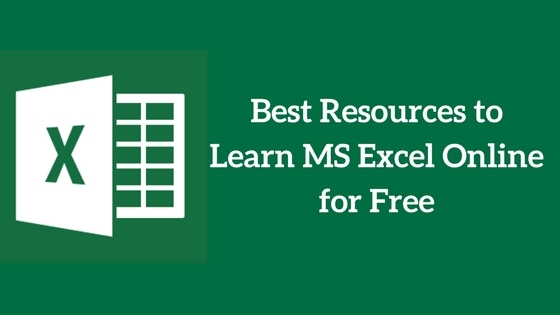 Excel Central is a noteworthy free site to learn MS Excel online. Four versions of programs are available. Contextures provides you a great way of learning Excel online for free. It has everything you require to become a master in Excel. Added to this, a variety of lessons, sample files, and videos help you. Tips and tutorials are available for free. The tips and tutorials search occur in an indexed order. Excel Hero is the best website to learn MS Excel online. It is an excellent resource for beginners. Many of the workbooks are available for download. Excel Hero’s blog gives additional information. Mr. Excel is another noteworthy site to learn excel online. It includes a variety of tips and tricks that will help you to learn excel. Besides this, free webinars guide you further. This will help you to get insights into the featured topics. In addition, the site appears in subject sequences. Besides, Mr.Excel.com expert group can answer questions of the users. The site has a library of essential Excel books and tutorials. It is another important source to learn Microsoft Excel online. It has free videos and webinars that will improve your knowledge of Excel. In addition, it introduces topics such as the VLOOKUP function. Excel Easy is one of the easy resources to learn Excel online. Beginners will find it to be helpful. The website contains six essential topics. The introduction deals with subjects such as Range, and Formulas and Functions. An additional of 300 examples prove helpful. ExcelJet is the best online site to learn Excel Shortcuts for Windows and Mac. Quick reference for keyboard shortcuts prove to be user-friendly. You can jet through a program without using the mouse. Annielytics is one of the most genuine sites to learn Excel online. This site by Annie Cushing proves helpful. Annie is a web analytics data expert. Videos and tutorials on Excel in this site are informative. You can learn most of the above courses in a self-paced manner. Khan Academy is one of the best sources to learn MS Excel online. It includes many video-tutorials on MS Excel. Instructive videos solve queries on Excel. Khan Academy offers ample free training courses. These courses are on varying subjects. The spreadsheet page is an online excel tutorial which provides extensive tutorials and books on Microsoft Excel. This website is handled by John Walkenbach. He is written more than 60 books for the users. Besides, he has written 300 articles about MS Excel. Therefore, you will get the examples of custom number formats, which you can play with and tweak on your own time. It also helps you to get familiar in Microsoft Excel. Excel Bytes is a website which is handled by Microsoft Excel specialist Mike Rempel. From this resource, you can get the free video tutorials and tips about Microsoft Excel. It also contains a collection of different how-to tutorials. Excel Functions.net is a reliable resource to learn MS Excel online. It has a collection of tutorial and tips about MS Excel. It will help you to learn the basic excel functions & formulas, pivot tables, macros, VBA, etc. Best Excel Tutorial is a complex and completely free resource for learning MS Excel through online. It explores database functions with the most common function you would ever utilize when creating or mining a database. Besides, you will get essential tips and tutorials on Microsoft Excel. This is a free resource which helps you to learn about the Excel VBA. In this tutorial, you will learn how to create your own macros. It also helps you to take your Excel skills into the next level and establish yourself ahead of the competition. Above guidance to learn Excel online will definitely enrich your scope. Go through the Excel lessons to master your craft.